ARC staff are very helpful and knowledgeable. If you feel like you need to do something to assist a student but aren’t sure what to do or how to proceed, reach out to the ARC team. Visit the website for information and resources, but feel free to call or email a member of the ARC team as well.Key contacts for disability-related topics are Chanelle (Nellie) Hopmann, Interim Academic ADA Coordinator, and Cindy Yamnitz, Assistive Technology Program Coordinator. You can find more information on the ARC staff here. 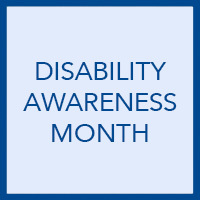 To read previous Disability Awareness Month tips, follow the links below.